Last weekend I was lucky enough to go to the ASCD conference in Atlanta. Five educators from our school attended, and we spent each day soaking up ideas and knowledge from other educators, then sharing what we learned among our team. It was the perfect weekend (albeit a bit exhausting), and on the last day, we had the chance to delve deeper into the Edcamp model. The last session that I chose to go to was called “Using the Edcamp Unconference Model for Your School’s Professional Development,” and was presented by Dan Callahan and Mike Ritzius, the founders of the Edcamp movement. I was tired, both mentally and physically, and really just wanted to go home at this point (i.e., the way most of our teachers feel by Friday afternoon, when we hold our weekly professional development). 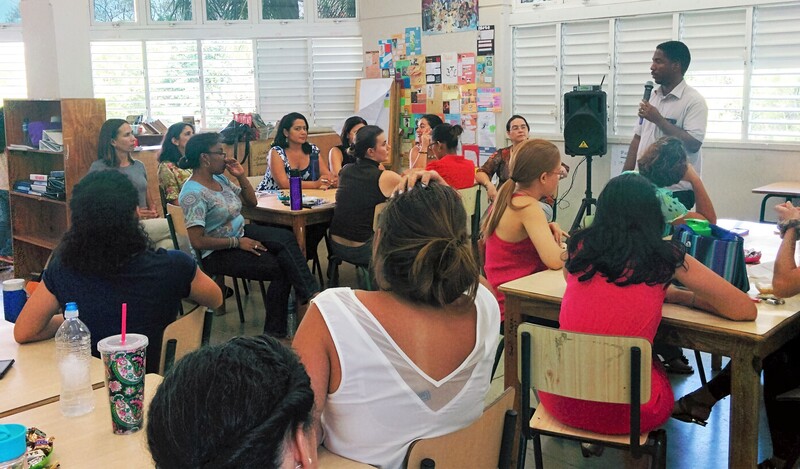 But since our school will be hosting the first Edcamp in the Dominican Republic in one short month, I was not going to miss this one. So off I went. Dan and Mike taught their session through a simulation of Edcamp, divided into two half-hour sessions. I’d never been to an Edcamp and was amazed at the simplicity of it. On a blank schedule some of the attendees wrote up questions and ideas they’d like to discuss and we met in groups to discuss them. There was no presenter, no sage on the stage, just a group of educators sharing experiences and ideas. For those of you who have been to an Edcamp, you know how motivating and invigorating they are. But I was a newbie and, for me, this was a revelation. I forgot that I was tired as took part in stimulating conversations with educators from around the world. Inspired, I discussed the session with our instructional coaches that evening, and we decided to hold a small Edcamp with our 50 teachers during our Friday professional development. On Monday, I was enthused and convinced that our teachers would love it, but by Thursday, I had cold feet. What if it didn’t work? What if they didn’t connect? What if they used their time to talk about their weekend plans? I’ve been working hard to give up control — after all, if I want teachers to be less controlling in their classrooms, I have to model that, right? But giving up control often makes anxiety rear its ugly head. Luckily, I work with a positive group of coaches who jumped in to reassure me: It’ll be okay. Trust the process. And anyway, what’s the worst that could happen? We learn through taking risks, so go for it. 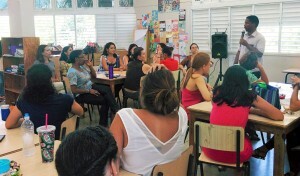 This is how it went: we invited our teachers from elementary and secondary school to join us. On the wall, we had papers set up for six rooms and two sessions. 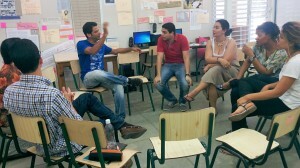 We explained how Edcamp works, and asked teachers to come up and write down their ideas or questions for the sessions. At first, nobody moved. But with a little prompting, the first few teachers took the markers we offered and began to write. Then the others joined, and before we knew it, there was an animated conversation going on about the sessions and who wanted to go where. Then we sent them off to the rooms to talk for half an hour. There was no need for fear — it was amazing! 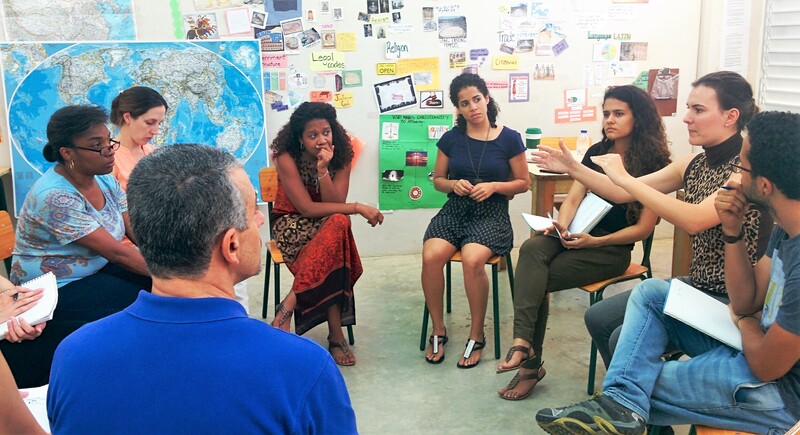 Conversations were animated, everyone was engaged, and so much sharing and learning went on. Teachers made themselves comfy: some sat in cozy corners, others formed circles for discussion, and one group turned on a teaching video and sat on the floor to watch. Remember, this was a Friday afternoon — our teachers were tired and ready for the weekend — but for the first time ever, we had to stop teachers and tell them it was time to go. So, it looks like we’ll be doing more Edcamp professional development in the future. Next time, we’ll probably work around a theme and let teachers know in advance, so they can think a little more about what they’d like to discuss. We’re trying to make our weekly professional development as meaningful as possible for our teachers and let them be in control of what they’d like to learn. This is definitely a step in the right direction. Our thanks to Dan Callahan and Mike Ritzius for coming up with this genius idea and sharing it with us!! I enjoyed every second, I’m really glad we did it. It’s amazing to see how something so simple can give you such meaningful results. I so agree, Ylonka! Best PD ever and hassle free. We definitely need to do more of this! Congrats on implementing this so quickly! I would love to hear what “categories” or “topics of discussion” the teachers came up with if your comfortable with sharing–could be general, as well. I just am trying to see this model can work for one site. I have participated only on a larger scale, so I’m interested. Thanks! Great meeting you at ASCD this year. Your school looks like an amazing dream. Hi Annemarie, I’d be more than happy to share. We asked them to put up questions or ideas for the sessions and they came up with: teaching diverse learners (differentiation), Using the app “classdojo”, building rapport with students, understanding the adolescent brain, how to create meaningful and fun independent reading responses, process vs product, making content relevant and how to link it to the present day, integrating mindfulness in our classrooms – how can we help our students survive daily stress, how to manage defiant students, using protocols in the classroom, education and technology. For this session we left it wide open. Next time we plan to work around a theme (probably creating student-led classrooms). Teachers noticed that the sessions that worked best were the ones that were more specific. Some of the subjects were just too wide open for a half hour discussion. Great meeting you too – looks like you also take part in some of the same twitter chats as I do! Great post. So important for others to see that it’s not only ok to change the status quo, the teachers really enjoy the change. 2 EdCamps coming up in Illinois this fall, and I’m presenting to Chicago Archdiocese on EdCamp for PD in early October – so excited. Thanks for sharing.